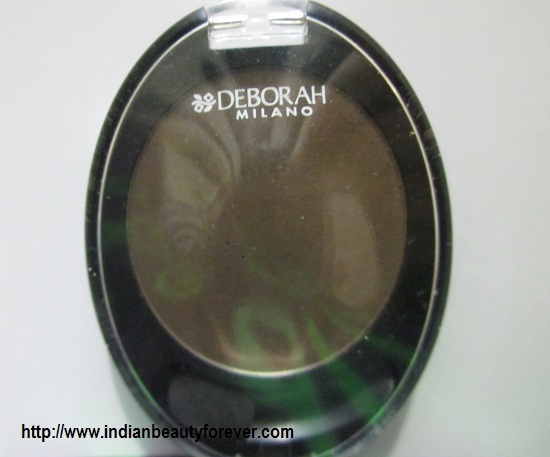 I will be reviewing another eye shadow today which is Deborah Milano Mineral Matte Mono Eyeshadow in quartz. This one is the latest addition in my single eye shadow collection. 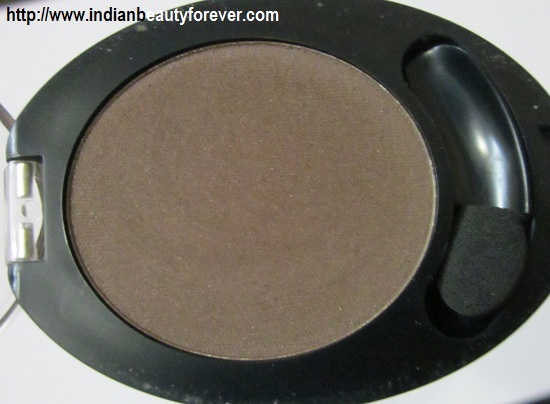 I have been looking for such a matte and deep brown color for quiet a long time and my search partially ended at this sleek very compact eyeshadow mono! My experience- This is my second purchase from Deborah Milano cosmetics. My first one was Deborah Milano white kajal pencil which was a decent product and made me to try some other products from their range. 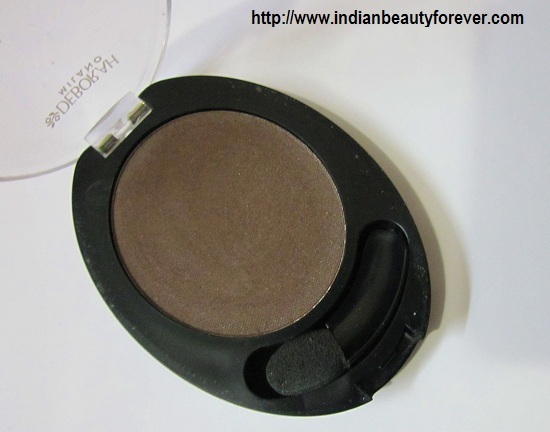 This Mineral Mat Mono Eyeshadow is called Quartz no 3 that comes in a flip top transparent flap. It's oval in shape with no mirror however, a little sponge tip applicator is provided which is so small well not small.. In fact very small that so far have never used it and don’t think will ever. Looks so cute by the way. What do you think?!!! The packaging is quiet sturdy which makes it easy to carry in makeup pouch or bag. It is a matte deep brown color which has dark grey undertones so you call it as an intermediate between brown and dark grey. it's a cool toned color! This color alone can be used for various purposes like as a lid color for a darker base, can be a great crease color if you are doing a soft smokey look or would want to avoid black or greys. if you have eyebrows a shade darker than this, then you may also use this to fill them. We should always try and use a brow color that is a shade lighter than the actual brow color, this I learnt somewhere when I use to think about filling my brows as they are quite full but when I take close ups for EOTD or reviews then the gaps magnifies. So, filling them helped me to make them look better. So this color can be used in a lot of ways and the texture is great. 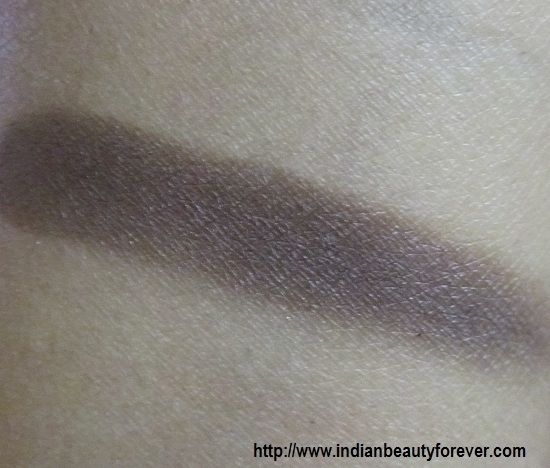 I was amazed by the staying power of this color which is worth mentioning and the eye primer makes that even better! The only thing that I wanted to see the ingredients which were not in there anywhere but still I absolutely love this color and have already used it for an eye look which I will be posting soon. Hopefully, you will like it! These Deborah Mineral Mattes come in other shades too and I am eyeing the Jade and Amethyst. They may not be the best eyeshadow but they are pretty decent matte eyeshadow at the price. That was all...Now, time to sum up the pros and cons. Available in Deborah counters and most of the online cosmetics websites. Others matte colors are also available to choose from. Price is quiet okay, it is available for less online. Great color with nice pigmentation. This color can be used for so many different looks. No mirror and the applicator is too small. Ingredients where are you .?? My Take- I would call this particular shade as a Multi purpose and would recommend it to those who are looking for something similar. I can't say whether the other variants would be the same when it comes to staying power, pigmentation etc. But this one has it all! Try is Nandini. :) Its a very pretty neutral shade. This kind of a brown is must have in everyones vanity...its really handy in most of the eye makeup looks..
No Althea, its a cool brown with grey tones, it will look muddy on the face.